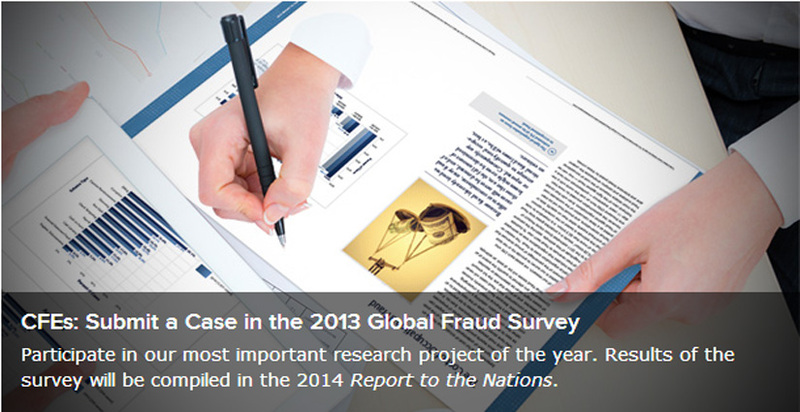 Thank you for your interest in the 2013 Global Fraud Survey. Upon completing the survey, you will be eligible for up to two (2) hours of ACFE (non-NASBA) CPE credit. Your completed response must be submitted by December 2, 2013. (5) your general observations and opinions. Please complete the survey in its entirety, providing as much detail as possible. Best estimates are permissible if precise data is not available. Please note that all monetary figures should be reported in U.S. dollars only. If your case involved currency other than U.S. dollars, use the applicable conversion rate as of the last date the fraud was still ongoing (i.e., the final occurrence of the fraud).We realize that information regarding your past fraud investigations may be sensitive, but please be assured that the survey does not require you to identify yourself, the victim, the perpetrator, or any other parties. Additionally, we will not publish or distribute any information that could identify anyone involved in the case. If you have any questions about the survey, please contact Andi McNeal at (800) 245-3321 or rtn@acfe.com.